Since I completed my first draft and started editing (coming along nicely, thanks for asking) I have started to think about the future. I now know that I will continue the story of Byrhtnoth in a second book. Perhaps a trilogy. More? Who knows. That brings with it a problem, A Title. 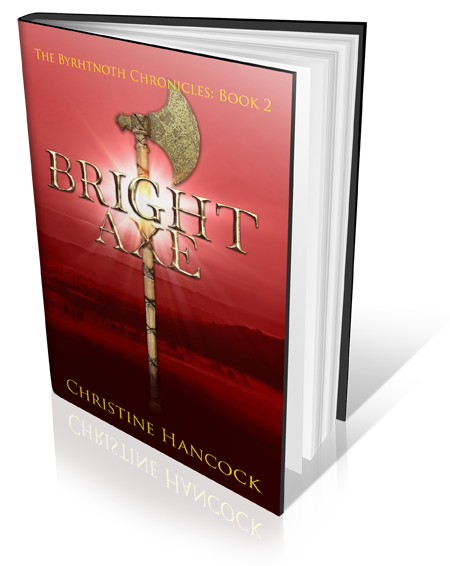 So far the book has been called “Byrhtnoth” or just “My book” (My Precious!). I need an overall “Chronicles of Byrhtnoth” or “Byrhtnoth’s Saga” type of thing. I’ll talk about that another time. The other thing a book needs is A Cover. This is something I have been thinking about for a long time – I wouldn’t say before I started writing, but close to it. I have ideas for covers to books I haven’t even written. I have been reading recent posts by Derek Birks about what he looks for in a cover on his blog here . And just looking at other authors books and deciding what I like. More important what I don’t like! My first conclusion is that you need a professional. However good you are, or think you are, an amateur cover always looks just that. People judge a book by its cover. So, by extension, if your cover looks amateur, the contents must be. Many of the covers that I have liked have been produced by the same designer, Avalon Graphics. They also do web graphics and advertising materials. All this was swirling around in my head when I saw a mention by Helen Hollick that Avalon Graphics was having a special April Offer on web advertisements. This was too good to miss, so I got in touch. I had an immediate reply from Cathy Helms (always a good sign) and we decided on three banners – for this blog, Twitter and a Facebook page I was thinking of starting. I sent her a couple of pictures of background I had come across online and liked. I requested a sword (Books of this period have to have a sword, don’t they?). I hadn’t found an image of a sword I liked, but I was specific in my request. It had to be the correct period (early to mid 10th century), It had to have a pattern welded blade and some gold on the hilt. The Battle of Maldon poem mentions Byrhtnoth’s “golden hilted sword”. Cathy did her best. She also found it difficult to find the right sword, we had to abandon the pattern welding, but within a few days she sent me three potential designs. There was a bit of discussion: background from number one, font from number two and sword from number three. Then, back to original sword. That was it! Every time I look at them, my heart swells with pride. Thank you Cathy, I’ll be back. All I need to do is make my book worthy of what I am sure will be a wonderful cover.